Revue Philosophique Independante des Hautes etudes / Hypnotisme, Theosophie, Kabbale, Franc-Maçonnerie, Sciences Occultes. Lyon, France. Language: French. Editor: Elie Steel; B. Nicolai. Succeeded by: La Paix Universelle 1/1, December 1890-June 1891. 4-8 pp., 3 francs a year. This was a short-lived journal that functioned as one of the organs of Papus's Groupe Independante des Etudes Esoteriques in Paris. The masthead announced the "collaboration" of Papus, Stanislaus de Guaita, F.-Ch. Barlet, Catulle Mendès, et al. Oswald Wirth reviewed Masonic matters for the journal. 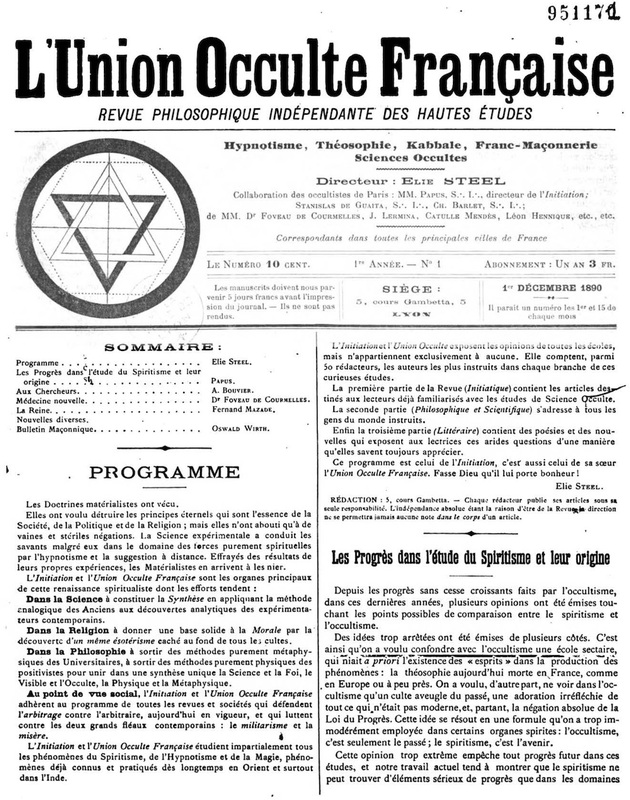 The name was changed to La Paix Universelle with the issue of July 1891, and the journal increasingly was devoted to mesmerism and spiritualism. BNF.